These grilled garlic shrimp are served with an easy butter dipping sauce. The marinade for this shrimp takes about 5 minutes to put together, and it flavors the shrimp perfectly. I used lime juice in the marinade, but lemon juice would be delicious as well. The dip is a flavorful combination of butter, garlic, lemon, and a touch of hot sauce and Worcestershire. Instead of hot sauce, add a bit of Asian-style chili paste (sambal) or Sriracha sauce. 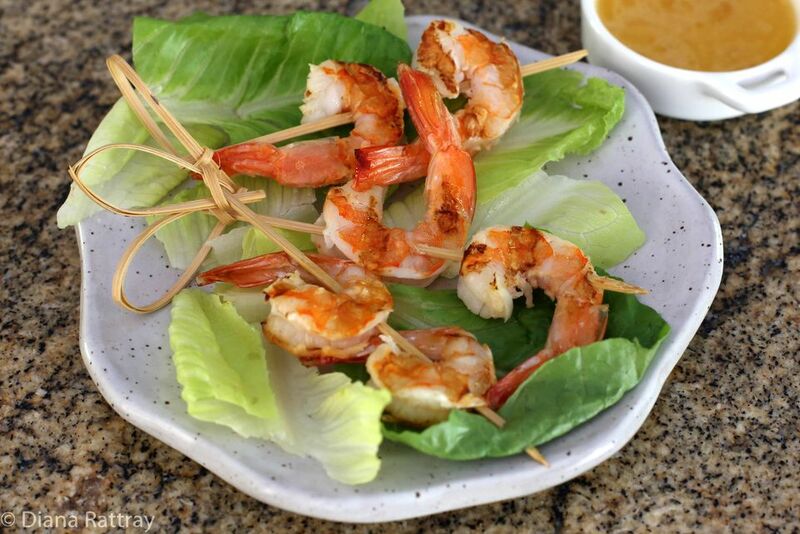 Serve the shrimp on lettuce leaves or mixed fresh greens along with small containers of butter dip. The shrimp goes well with rice and grilled summer squash or eggplant. Or add the shrimp to a tossed salad. Meanwhile, in a small saucepan over low heat, melt the butter. Add the Worcestershire sauce, juice of 1/2 lemon, hot pepper sauce, 1 clove of crushed garlic, and a dash of kosher salt. Heat for 1 minute. Serve in small serving dishes with the grilled shrimp. *The vein running down its back is the shrimp's intestinal tract, and it could be clear or gray to black. There's no harm in eating the veins, but they can be unpleasantly gritty. To remove the vein, run the tip of a small, sharp paring knife down the length of the back of the shrimp. Loosen the vein with the tip of the knife and then pull it out.